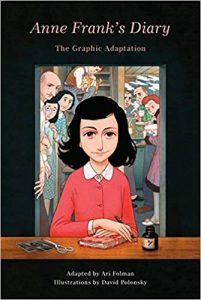 Anne Frank’s Diary: The Graphic Adaptation by Ari Folman, illustrations by David Polonsky (with a few by Hilda Noam). Pantheon, 2018. 9781101871799. 149pp including an afterward and notes from Folman on adapting the diary. In order to adapt Anne Frank’s diary, Folman, Polonsky, and Noam made bold choices. This book does not contain every word and detail from the original — instead it’s spacious, interpretive, and altogether wonderful. It gives itself enough room to be a great graphic novel, to establish the time and place Anne Frank lived, and to share what was going on in her head while she hid (with her family and others) in the secret apartment above her father’s business. The terror of being discovered is always there, but so is the boredom of the situation. 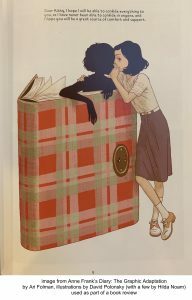 The focus is more on Anne and her life, though, and particularly her friend Kitty (her name for her diary). 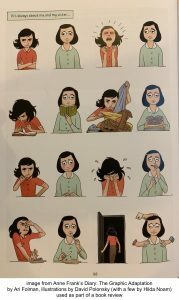 Her poor attitude and realistic relationships with her mother and sister bring her alive, as do the illustrations. I hope everyone reads this.